Stress can make an individual feel overwhelmed and helpless. 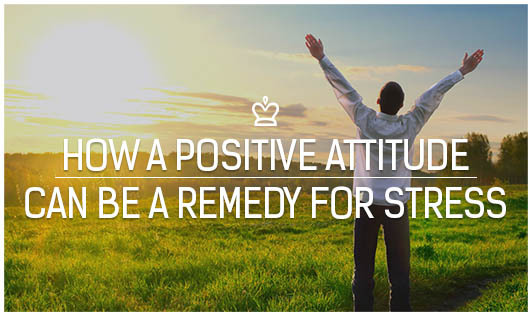 One very cost-effective remedy that can be used anytime and anywhere is developing a Positive Attitude. Keeping a positive outlook towards a stressful situation means you are looking at options that can help you resolve the stressor. Sometimes, it also means accepting that there is nothing you can do about it. A positive outlook towards stress can itself lift a lot of stress off your mind and increase performance level. Be calm. Breathe deeply and clear your mind of thoughts. Then look at the options you have. Keep telling yourself that you can get through the situation. Know that some situations need to be accepted as it is for the time being. Be as objective, realistic, and flexible as possible. Work on factors that are under your control and keep aside the factors that are beyond your reach. Think of the worst possible outcomes and its chances. Be prepared for it. Focus on the lessons you receive from every situation. Lastly, understand that changing your outlook towards stress and sustaining it will require efforts. The results are not magical, but it definitely raises your coping skills, increases your tolerance and threshold, and makes life better in the future.